"Born in 1848 and died in 1928; John Brown was a watchmaker and jeweller for nearly 50 years and a founder member of Ripley Town & Trade Association. He was a member of numerous local music societies. 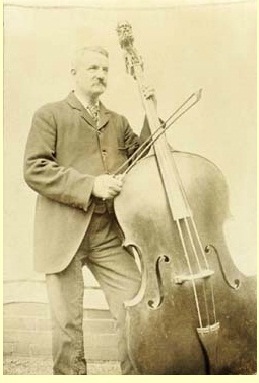 His double bass was unique with its classic carved head in place of the usual scroll. It was apparently made in about 1870 for the Paris Opera and only 6 were made, each with a different head and only one other is known to have survived which was also in England. (Details taken from a three and a half page typescript by a grand-daughter of John Brown, held at Ripley Library.)" This bass has been owned by Mike Calder, my first teacher, for over 40 years. I had lessons on it as a kid. Mike was principal bass with the Halle in the 1970s and after playing it at a concert he was approached by Miss Olive Deadman, from Blackley. She recognised the bass from its distinctive carved scroll and gave Mike a copy of the photo above. It was a 2x3 inch print, which Mike had blown up, and when he showed it to Olive, who was around 90 years old with failing eyesight, she burst into tears, as she could see it properly for the first time in an age. John Brown was Olives grandfather. On a trip to Paris Mike and Glynis visited Opera Garnier and saw 6 statues - one of them is idential to the head of this bass, so its probable that the set of instruments had carved scrolls to match statues in the place they were played.